First Step: fill out this Online Membership Form. Hit SUBMIT. A copy of your replies will fly to our Membership chair, Treasurer and Webmistress. You will then receive a confirmation email with your payment links. Second Step: Click on one of the payment links in your confirmation email. Individual Membership 2019 Dues = $35 plus a $1.35 cent Paypal credit handling fee. The total for the full year’s membership is $36.35. If you register after August 1st it’s $18 through the end of the year. Yay!. Remember a mailing stamp costs half a dollar now. Why not pay online? Family Membership 2019 Dues = $45 plus a $1.65 Paypal credit handling fee. Total is $46.45. Business Membership 2019 Dues = $45 plus a $1.65 Paypal credit handling fee. Total is $46.45. Remember: All renewing membership fees are due by Feb 15th. Any not received by then will be considered as Non-Paying Members and will have to pay the Non-Membership rates for all scheduled Polymer Clay Classes. Also, members who pay by Feb 15th get priority sign-up privileges for featured instructor’s classes and special guild sales. As Membership Chair, I will maintain the San Diego Polymer Clay Guild Membership Listing to keep all our members informed on all the latest Polymer Clay tools, techniques and activities. Exciting events such as the many fabulous workshops, classes, Round Robin, and of course the Sandy Camp Retreat, Round Robin, and of course the Sandy Camp Retreat. All which will be announced by our Communications Secretary. The membership year runs January to January. Monthly Meetings, with demonstration, show ‘n tell, raffles and an opportunity to meet other polymer clay enthusiasts. Non-Members – First visit is free, and then it’s $5 per meeting. Monthly Clay Days – Join us in our wonderful time at Clay Day, work on your projects, chat with our fellow polymer clay artists as well as checking out their way cool projects, work together on projects and share your talent, this is the day to have lots of fun. Non-Members – $15 per Clay Day. Get membership rate on all the Workshops and classes, and Sandy Camp Retreat. Members have first dibs and then non-members may sign up. Round Robins are for members only. 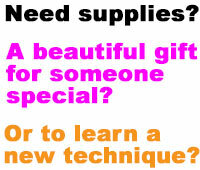 Have space on the San Diego Polymer Clay Guild Web page for your clay related projects. Check out polymer clay related books, tapes and magazines from our growing library. Sell your work or excess supplies at Meetings and Clay Days (request permission prior to the meeting from a member of the Rules and Ethics Committee). Group Purchases – on books and other times when the guild makes a group purchase.